Well, you might have seen the banners around the Heaton’s, so it’s definitely happening. Hope to see some of you at the 1st Heaton Moor Scout hut, from 5pm, Friday 4th May. 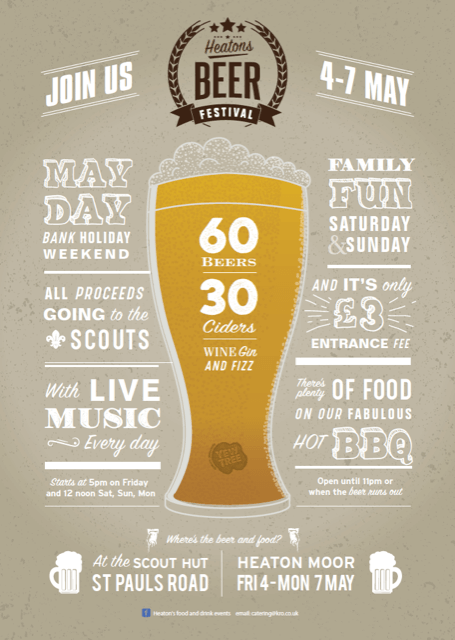 We’ll be selling a great range of ales and ciders and then some fizz and a selection of gins, to whet your appetite. More info on our FB page, Heatons Food and Drink Festivals. Feel free to like and share, to find more details. This year, we are trying to raise as much money as we can for the scouts, and they have asked me to see if we can get local businesses to sponsor a barrel. Your company name will be all over the brochure for the whole festival, and on the barrel for its duration. Social media will be advertising your company too, and all they want is 35 of your company’s pounds please. Yes, just £35, to help the scouts. If you are interested, please can you email me at catering@kro.co.uk. Thanks all, and really hope to see some of you down there. p.s. Then we’re planning a gin festival in St. Paul’s church, 27-28th July. I’ve been practicing really hard, trying different gins!!!! save the date.